“Ours has a lot more details and depth to it, because we’re looking at individual workers,” he said. June 20, 2017: University of California-Berkeley’s Institute For Research And Labor Employment released a study claiming that Seattle’s minimum wage hike has increased pay for workers without eliminating jobs. The study claims that it “was prepared at the request of the Mayor of Seattle,” and is immediately criticized for having a partisan-agenda and ignoring key facts. 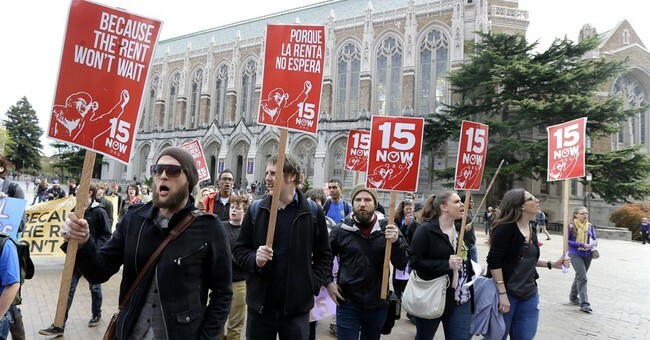 June 26, 2017: University of Washington researchers released a study that finds Seattle’s minimum wage increase has slashed workers’ hours, costing them on average $125 a month. The study is called “very credible,” by MIT economics professor David Autor and analysts from FiveThirtyEight and The Washington Post both acknowledge that these findings are bad news for those that support minimum wage increases. June 26, 2017: The Seattle Weekly’s Daniel Person publishes a piece entitled, “The City Knew the Bad Minimum Wage Report Was Coming Out, So It Called Up Berkeley,” with quotes from Seattle Mayor Ed Murray’s spokesperson indicating that the Mayor’s office was aware that University of Washington’s report would not have favorable results for minimum wage increase advocates. Person’s reporting then states that the Mayor’s office shared University of Washington’s findings with UC-Berkeley researchers that were supportive of minimum wage hikes, in order to give UC-Berkeley a chance to craft their own report that had positive results about the increase. Sawant, a former economics professor at Seattle Central Community College who ran for office as a Socialist, accused the UW team of “ideologically editorializing." She and Mayor Ed Murray then contacted Michael Reich, an economics professor at the University of California at Berkeley. Liberals, there are times where the data is not on your side. Concerning the minimum wage, there are now two reports showing that it hurts workers. Now, you’ve resorted to preempting your own data teams that are coming up with less than rosy pictures. The $15/hour minimum wage is a very, very bad idea. And it’s not just Seattle suffering the consequences. New York’s workers are faced with fewer jobs, fewer hours, and less pay due to minimum wage fever taking hold in Albany.